It’s been a while. Lavender Diamond’s original lineup (Becky Stark, Steve Gregoropoulos, Jeff Rosenberg and Ron Reje Jr) have been working together again recently, and the new songs, debuted live in recent months, are catchy and astonishing — Becky is now using her opera register in truly goosebump-granting/breathtaking ways, and the band’s arrangements are thoughtful, their playing sympathetic. At the last show I saw, people began applauding midway through a particularly stunning new song (see video extract here, on Facebook). When was the last time you saw that happen? 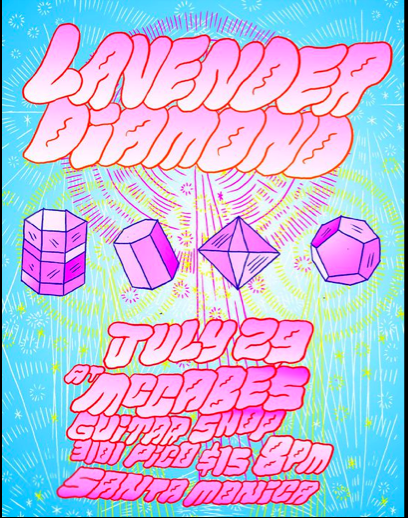 Lavender Diamond are playing an all-ages show in one of L.A.’s finest music venues, McCabe’s Guitar Shop, in two weeks, on Friday, July 29. Prepare for beauty.